Apple Music has said it will continue to tie artists to exclusive deals, as its number of paid subscribers passes 20 million for the first time. There has been criticism that putting albums behind a streaming paywall harms fans and, ultimately, artists. "I don't think exclusives or promotions are anything new," Apple Music boss Eddy Cue said. "They were done in the record business, they were done on iTunes, now they're being done on streaming." He continued: "The exclusives are relatively short term - it's not something that stays on any one platform. But being able to do unique things with artists is a good thing and I think that'll continue." Cue said Apple had hosted 70 exclusives over the last year, six of which topped the US Billboard charts, including Drake's Views. Apple also streamed Chance The Rapper's Coloring Book, which made history on Tuesday by becoming the first album to be nominated for the Grammys without being available in shops or download stores. However, Universal Music Group chief executive Lucian Grainge recently called for an end to exclusives. And Kanye West has said streaming companies are engaged in a testosterone-fuelled battle that was ruining the music industry - despite releasing his own album as an exclusive on Jay Z's Tidal service. Cue told the BBC that exclusives were "not the answer to everything" but they "served their purpose". One purpose is undoubtedly to attract new customers - and Apple has gained three million new subscribers in the last three months. 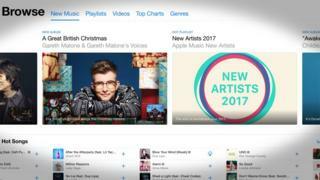 The tech company said 60% of its users had not downloaded a song from the iTunes store over the last 12 months, suggesting they were a "whole new audience". Launched in June 2015, Apple Music has swiftly become the second biggest player in the market - behind Spotify, which now boasts 40 million subscribers. Their popularity has helped reinvigorate the music industry, which recently saw its first big gain in revenue for 20 years. The increase was largely due to a 45% increase in streaming revenue, with sites like Apple, Deezer, Tidal and Spotify charging £10 per month for instant access to millions of songs. Cue and Apple Music DJ Zane Lowe spoke to the BBC as the company revealed its most popular music and apps of 2016. See the full charts on iTunes. Zane, what's your view of music in the last 12 months? Zane Lowe: It's been a mad year, hasn't it? When I think back over the last 12 months, I've turned to music so many times. It's been the consistent bringer of joy in an otherwise fairly emotional year. A lot of huge superstars have really shown themselves to be just that this year, [with] people like Drake releasing multiple records. And I think Skepta is the number one superstar coming out of the UK in 2016. Drake is doing huge numbers on streaming - but that means he dominates the charts at the expense of new music. Does that concern you? ZL: I don't run the charts and I don't have any influence over the charts. What we do is we focus on bringing new music to its audience, and that's always been the equation that matters to us. Where the charts fit in to that, I don't give any huge amount of thought, to be honest with you. Is it possible to create a star entirely within the Apple Music ecosystem, without TV or magazines or radio play? Eddy Cue: I think we've shown with somebody like Chance The Rapper that we can bring him into the charts. ZL: Take Christine and the Queens - she was only recognised in France when we started playing her and all of a sudden she is regarded as one of the breakout artists of the last 12 to 18 months. It won't come as a surprise when I tell you that I think Beats 1 and Apple Music have played a really valuable role in bringing an artist like Christine to a global audience,. Most streaming services charge £10 a month - but recently Amazon Unlimited and Electric Jukebox have started experimenting with lower prices. How closely are you monitoring their subscriber numbers? EC: We watch what all of our competitors are doing. There are a lot of promotions and different ways for people to do things around pricing. But we're looking at ways to help artists get discovered, to make it easier for you to listen to music. All those kinds of things is the focus we have. You've done well from exclusives this year, but a lot of fans get aggrieved when their favourite artist streams music exclusively on a service they don't subscribe to. Will you continue to pursue those deals? EC: I don't think exclusives or promotions are anything new. They were done in the record business, they were done in the cassette business, they were done on iTunes and now they're being done on streaming. The exclusives are relatively short term - it's not something that stays on any one platform. But being able to do unique things with artists is a good thing and I think that'll continue. If you look at Kanye's latest album The Life Of Pablo, it was pirated hundreds of thousands of times when it was an exclusive on Tidal. Isn't that damaging to the industry? EC: Again, if done correctly, I think they can serve a purpose. They're not the answer to everything. But when we've done things with Drake, for example, or Frank Ocean, they've worked really well for them and for us. How important is it to invest in content now that iPhone sales are slowing down? EC: That's a loaded question! Look, I think we are going to continue to invest in music in a huge way, whether it's new pieces of software, Beats headphones or the audio that we do. We've just released the greatest-sounding iPhone we've ever done with stereo speakers, so we're committed to audio and the music business in a huge way - along with continuing to invest in all of our hardware business which is doing quite well. Would you consider upgrading Apple Music to high-fidelity or "lossless" audio? EC: There's a lot of talk about that - but what we've focused on is making sure we get the best masters. One of the things we realised early on when we were doing iTunes was that the quality of the songs we were getting sometimes weren't the best - because they weren't coming directly from the master tapes. They had already been pre-processed and all that. So we spent a lot of time [obtaining those] so that the quality of audio that you're getting from us is really indiscernible from any other mechanism.